Nothing is easier than ordering Chinese take-out, but this recipe sure comes close!! Ham fried rice has always been my favorite thing to order at Chinese restaurants, but now I can make it in the comfort of my own home when we don't have the money to go out to eat. 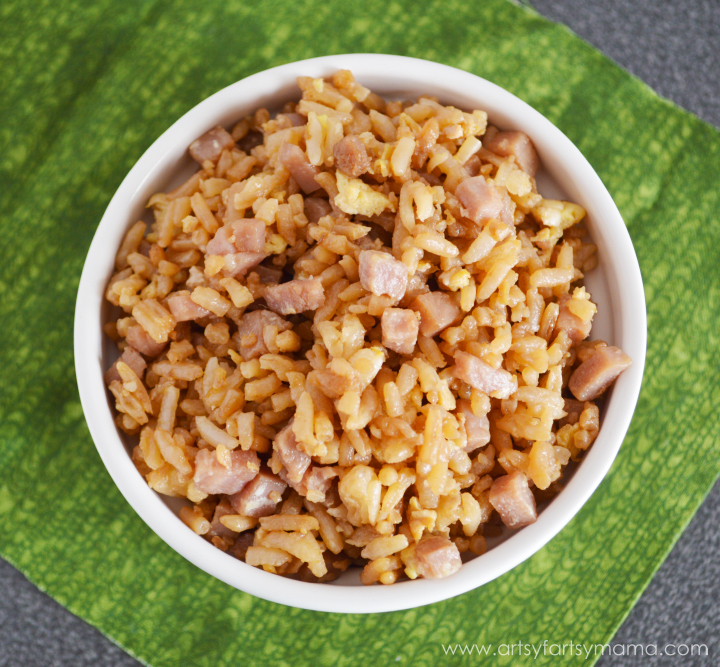 This ham fried rice comes together in less than 20 minutes, and you can do a lot of the prep beforehand to make it go even faster. You can either cook the rice fresh (right before you want to start cooking), or make it the night or morning before you want to eat. I cooked mine in the rice cooker the morning of, and it turned out great. You can also use frozen vegetables and packaged diced ham to really save on time! In a large wok or skillet, warm oil at medium heat. Add in ham and cook until heated through. Add in vegetables (optional) and cook until tender. Move ham & vegetables to the side (or make a hole in the center of the pan) and add the eggs. Cook until egg is scrambled and firm, then mix with ham and vegetables. Add rice to the ham, vegetable, and egg mixture. Pour soy sauce on rice, then stir until combined and heated through. Serve immediately with Baked Sweet & Sour Chicken. Thanks for sharing on My 2 Favorite Things on Thursday!! Come back next week and share your stuff!! Thanks for sharing at Talented Tuesday Link Party! Come back this week to share with us again!